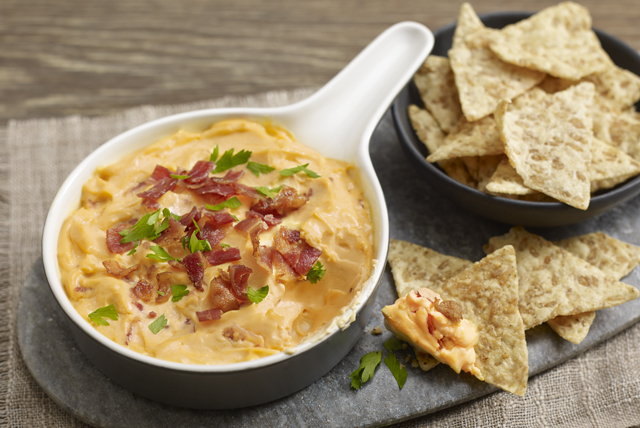 Our Creamy Cheddar-Bacon Dip will have everyone asking for the recipe. With only a handful of ingredients, this tasty dip is definitely going to be a keeper! Reserve half the bacon for later use. Mix remaining ingredients in medium bowl until blended; stir in remaining bacon. Spoon cream cheese mixture into small baking dish sprayed with cooking spray. Bake 25 min. or until heated through, topping with reserved bacon for the last 5 min. Serve with tortilla chips or colourful cut-up fresh vegetables. This smoky dip can be mixed together ahead of time. Refrigerate up to 24 hours before baking as directed, increasing the baking time to 30 min. or until dip is heated through.